DUMBARTON lost 2-0 to a confident East Fife in their first competitive home game of the season at the Cheaper Insurance Direct Stadium. DUMBARTON lost 2-0 to a confident East Fife in their first competitive home game of the season on a warm evening at the Cheaper Insurance Direct Stadium. The defeat leaves the men from the Rock with all to do in the Betfred Scottish League Cup, Group A North, having drawn 2-2 away to Forfar Athletic in the first match and lost the penalty shootout 5-3. Gary Naysmith's men went in front on 19 minutes, when Scott Mercer crossed in from the right and ex-Son Kevin Smith glanced a header past keeper Mark Brown. 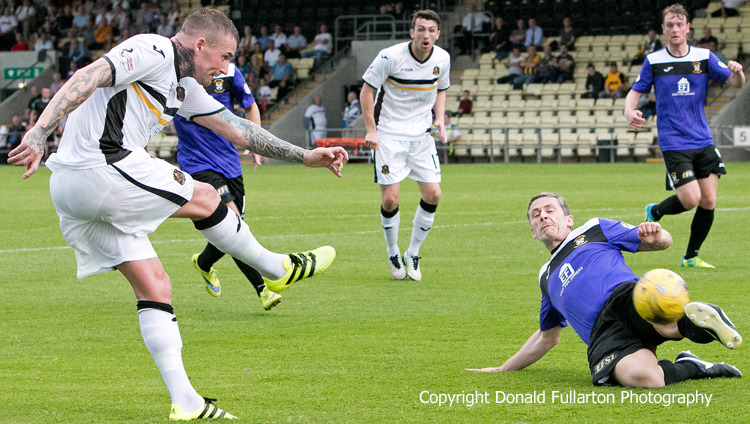 Dumbarton continued to find themselves on the back foot in the heat, and on 39 minutes the Fifers made it 2-0. The visitors walked the ball through the Dumbarton defence, allowing Paul McManus — often a scourge of Sons at his many clubs — to divert home from close range. Sons started the second half brightly, putting some dangerous balls into the box. But the visitors were defending well. On 56 minutes Sons went down to ten men. Grant Gallagher received a red card after frustration got the better of him and he kicked out at Smith. From then on there was no way back for Dumbarton, despite Josh Todd nearly pulling a goal back towards the end. The picture shows a defender blocking Ryan Stevenson's shot.